Deep in the New England woods, Kali leaps from behind a pine tree, skulls jangling from her waist and an upraised knife in her hand. A band of women halts and the goddess and mortals face one another. “What must you do to pass?” Kali demands. After a few silent seconds, I step forward and take Kali’s hands, waltzing with her until I reach the other side where I continue on to the moon ceremony that was our destination that night. A decade ago I waltzed with a priestess dressed as Kali at a Goddess camp. When I stared at the recreated wrathful goddess blocking my way, I knew that I could not run past or fight her, so dancing with all that She represented was my only option. I cannot say that I encountered Kali Herself that night but, since then, I have experienced over and over the transforming power of choosing to engage the wildness, mystery, beauty, truth, and chaos of our dynamic universe and of expressing both creative and destructive aspects of this spirit in our everyday lives. Over the years, in my own life and in those of so many people I have known, I have come to recognize how the decision, in its many manifestations, to “dance with Kali” remakes us for the better. Perhaps you respond to a tragedy by jumping into the thick of the trauma and chaos in a way that shows you your strength and competence. You take a chance on changing your life’s direction because of a surprise encounter. You give birth knowing that your life will change in ways you cannot imagine. If you look at a person’s years on Earth as a vast sky, these choices to dare are the brightest stars that shine amidst a life with millions of decisions. Though “dancing” with this spirit offers much wisdom, I have seen that, most importantly for me, to do it has required giving up an illusion which insidiously pervades our culture: the notion that we can and should be in control of all aspects of our lives, of ourselves, and of all that may affect us. For after all, the spirit I met is as uncontrollable as a volcano or hurricane, the abundance of life on earth, or the seeming randomness of death. How many years and opportunities have I wasted not making full use of my gifts, but rather choosing the safe path, and constraining my true self in order to feel for a fleeting moment that I am somehow in control and therefore able to ensure a life free from catastrophe? What would my life have been like if I had been brought up in a society that taught everyone to embrace life’s wild dance rather than chase after a control that can never exist? While at one time I would have found “dancing” as a way of life stressful, now it is a relief. I no longer need to struggle to be in control all the time. If I am not doing what I imagined I would be at midlife, I am not a failure but rather someone who was able to change my idea of success in order to fulfill an evolving sense of mission. I understand that anxiety is an over-reaching for control rather than a reasonable response. I know that I am most likely strong and competent enough to cope with most of life’s surprises–which I am finding is a much better and more realistic way of living in an uncertain world than trying to have an overly orderly, thoroughly planned life. What is true for individuals is even more so for our societies. We think that we can command nature and make Her do our bidding–yet we end up with environmental disaster. Any hope of real love relationships dissolves in the belief that those designated the heads of households can and should rule the lives, behavior, hearts and souls of their family members. Too often the first response to conflict is to overwhelm with military force, and so we have a globe afire with constant wars within and between nations. What if, instead, our global community chose to “dance” at key decision-points? I believe our society would look much more like matriarchy, with cooperation in reverence for relationships, and with each individual valued over conflict and coercion. We might come to respect nature’s power and consider how our lives should be in service to the Earth. Movements towards justice and equality would no longer be hindered by those afraid of a world in which those different from themselves have a say and in which change is an expected good. Cooperation would be encouraged when we realize that we can never rule hearts and minds by force. We would no longer hesitate to take care of each other knowing that we, too, could have been born in the circumstancse of another or that we could have suffered the fate that brought another down. Once we remove the simple lie that total control is possible, so many obstacles to a more just, peaceful, and sustainable world begin to crumble. As I ponder how to help midwife a society that “dances,” I think of that night in the woods when one priestess was able to embody so meaningfully the spirit of giving up control for the women who came across her path. Perhaps each of us can use our powers of creativity – whether through drama, poetry, song, dance, storytelling, painting or drawing – to remind others of the many encounters they have every day with this spirit. Maybe we can paint to evoke a sense of awe at a magnificent sunset, or make a poem about a green shoot coming out of the composted ground, or find a way to recreate the goddess in our business meetings and quiet conversations. Each of us, in so many ways, holds the spirit that cannot be controlled of inside us, and it is up to us to lead the dance, not only to a moon ceremony in the woods, but to a new way of being for all. Carolyn Lee Boyd is a human services administrator, herb gardener, and writer whose work focuses on the sacred in the everyday lives of women. Her essays, short stories, memoirs, reviews and more have been published in numerous print and online publications. You can read more of her work at her blog, www.goddessinateapot.wordpress.com. I too have found that giving up the need to control everything is the path to healing. Thanks for an insight-full post. 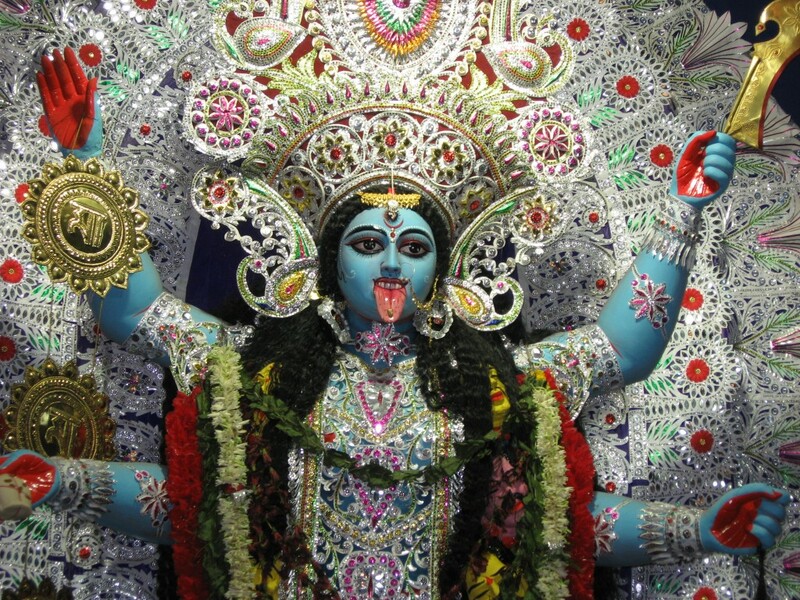 The many-armed goddesses in Hinduism and Buddhism are fascinating, aren’t they. And to dance with such a goddess, or even have a cup of tea with one would be wildly wonderful indeed. I remember an old Star Trek TV episode in which the Captain enters a nightclub on a distant planet and finds a four-armed lady playing the piano with all four hands!!! The music was fabulous, sounding something like ragtime. What an inventive sci-fi idea that was, and how very creative your post today, a delightful read, thank you, Carolyn. Brava! Very insightful blog. I think everybody needs to understand about dancing with Kali. And other goddesses. Maybe the Roman Curia should dance with Kali?? That would certainly be interesting to watch. Thank you for this inspiring post. I am moved to share a poem I wrote a few years ago. It’s all in the rhythm. Falseness throws you off beat. what is coming to birth. Don’t hold onto the tide. Don’t be a drag on the moon. Let go let go let go. Thanks for sharing your poem! Yes, balance and rhythm are so important, and very tricky to accomplish. Old Crone of mystery, I must let go. Great Crone of ecstasy, help me let go. Transform me, Old Hag, so that I will let go. Cast open the door for me, I’m letting go. Rebirth, rebirth, death and rebirth. Thanks, Carolyn, for this post. I need reminders to let go, and this one was well-written. Your depiction of Kali implies, but doesn’t state outright that “lila” (play) is the way she operates in Hindu mythology. I love that about Her. I’m not sure that on a social level we can dance with Kali. At least at this point in history, that seems like a huge stretch. But I can see that movement in that direction is needed, rather than the rigid and belligerent attempts at control that move us towards (and sometimes into) conflict or towards stalemates like we have in our Congress right now. Cooperation is a dance of sorts, rather than the dirty word that most Americans believe it to be. I agree Nancy. We need to try to change the things we can change…That is not the same as controlling everything in our lives and in Life. I do not hold one of the Hindu views, namely that life is maya, I don’t know about you. But I do agree that learning that we cannot control everything that happens in life and that happens to us personally is an important insight. I agree Carol. Maya is not one of the concepts that I find helpful. But there are many different Hinduisms, and in the ones to which I’m drawn, maya doesn’t play a part. My grandmother is dying right now and my mom is doulaing her through the transition. *oops, so this was a relevant post to read. I especially enjoyed the follow up poem in the comments. Carolyn, great post, thank you! In Buddhism “letting go” is one of the most important practices, if not the most important. In Buddhist meditation it becomes obvious to a practitioner that she cannot control her thoughts, emotions, memories, or her body even for a second: she can only be mindful of them. I like your point about social letting go of control. Patriarchal religions are so much about controlling people’s lives: some to larger extent, some to lesser. This is one of the reasons why I do not see it as a problem that Goddess movement does not have homogenous thealogy or organisation. As long as each of us is strong in our spiritual practice, we are fine.